This easy gazpacho soup recipe is sponsored by Naked juices and Glam media but all opinions expressed are my own. It is relatively easy for me to get my family to eat more fruit. A bowl of grapes on the table disappears in minutes. The kids are always happy to drink smoothies with plenty of berries and bananas in them. However, getting more vegetables into my family’s diet is not as easy. I do not want to eat carrot sticks for breakfast. I am not as tempted to reach for vegetables as a snack, either. I was recently asked to try out the new line of Naked Power Garden drinks and come up with a creative summer recipe. I have tried a number of the Naked juices but never a veggie based one and I was excited to try it out in a recipe. While most people consider soup a fall meal, there are several cold soups that make a perfect addition to your summer menu. This gazpacho soup recipe requires absolutely NO cooking and you can make it up in the morning and let it sit til dinner. That makes it a great addition to your next pot luck or dinner party since you don’t have to slave over it while you would rather be socializing. 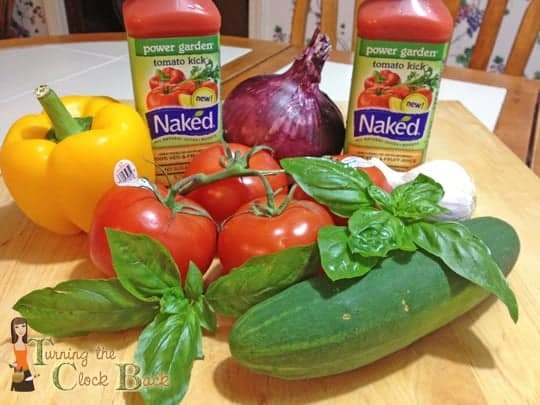 If you would like to try this easy gazpacho soup recipe, head over to the Naked Juice website and learn more about the Tomato Kick Power Garden that I included in it as a replacement for traditional tomato juice. You get a pound of veggies in every bottle which is a great way to up your intake of vegetables. It also comes in a Berry Veggie if that is more to your liking. The Tomato Kick contains 2.5 Tomatoes , 1/4 Red Bell Pepper, 3/4 Celery Stalk, 1/5 Carrot, 1/2 Orange and a hint of lemon. I would love it if you would stop back by my blog on MONDAY, June 17th and learn how you can vote for this recipe in the Naked Juice Pinterest contest. Voters will be entered in the “Pin It To Win It! Win A Naked Juice Garden Gift Basket” sweepstakes. A zesty cold tomato soup that needs no cooking. Perfect for a summer dinner when it is too hot to cook! Coarsely chop the vegetables and place in a food processor. Process on medium high until very finely chopped. Do not puree. You want there to be a bit of texture to the soup! Into a large bowl combine the Naked Power Garden juice, processed vegetables and all other ingredients. Power Garden is Naked Juice’s new veggie drink lineup with 1lb. of veggies in every bottle*. With delicious flavors that only Naked could blend, Power Garden offers one of the easiest ways to get your daily servings of veggies and fruits, along with good sources of fiber, vitamins and minerals. Learn more at . 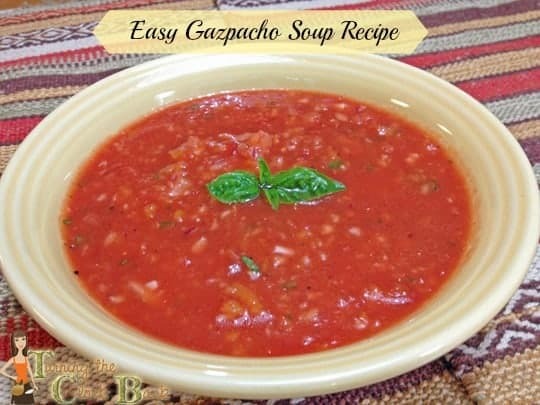 I have never made gazpacho soup, I always thought it would be a time consuming recipe and difficult to make. This however sounds easy and delicious and would be perfect on a hot summer day! Wow! That is a genius way to use Naked Power Garden Tomato Kick. Now you have me thinking of new ways to use the Naked drinks that I like. Great recipe! Yum! That sounds good. I haven't seen this one yet but I'll keep my eyes open! Wow! That looks delicious and perfect for summer! I can't wait to make it myself!